An energizing super shake with loads of potassium and antioxidants! I am a whole-hearted fan of my blender to get the nutrients my body needs without sacrificing time. Did you know avocado contains more potassium than bananas? Try swapping out your typical banana base with avocados to amp up your shakes with superfood levels of healthy fats, fiber and nutrients without sacrificing the creaminess you love. Time to blend up this delicious and energizing morning smoothie with the antioxidant power of green tea and attack that to-do list! 2. 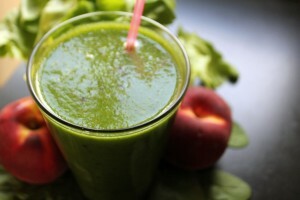 Pour your healthy and delicious smoothie into a tall glass and enjoy! « 1 in 2 people will get this disease – Will it be you?